Last Wednesday, a small crowd gathered in a wine shop in The Hague to run a test of the Perspectivity Public Health Challenge. The dynamics were good: lots of laughther, anger and frustration. Some useful improvements were identified and are now being incorporated for the next test. 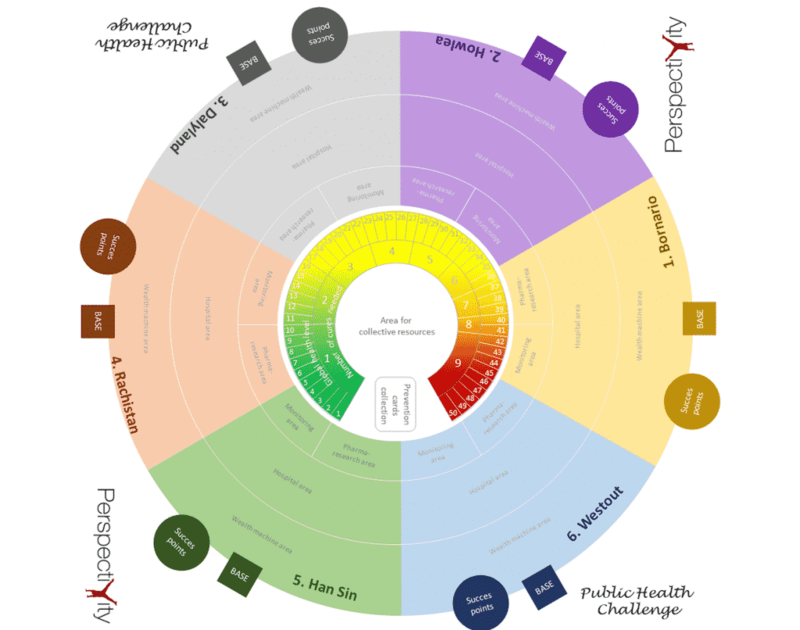 The Public Health challenge is the latest product in the catalogue of game themes that Perspectivity is building up: climate, food, national security, decision-making and now also public health. The game deals with dilemmas of preventing or curing diseases, the price of medicine and how to pay for healthcare investments. The team’s first ‘moment of truth’ is approaching rapidly: 80 LSHTM students will play the challenge at Thursday May 7th in London. Tom Hitchman of Perspectivity’s UK hub has kindly volunteered as a gameleader. We look forward to it!